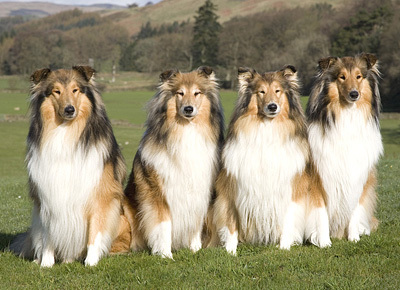 Our holiday to Moneive was timed to coincide with the Scottish Collie Club open show. This turned out to be a good choice having been awarded first place for Connor, Kerry, Holly and Tess. Notably, Tess also went on to take Reserve Best in Show. After the show (on Sunday) we had a wonderful week of exploring Ayrshire, and amongst the many beautiful locations we found a rugged and scenic Loch Doon. We have always tried to keep in contact with our pups and their owners. Emails with news of how they are doing are lovely to receive but we were delighted to be invited to receive an invitation to Saffron Walden in Essex to see Ivy and the Phillips family. So, on an unseasonably warm Sunday in late April we set off with Kerry and Connor in the car to see how the now 19 month old Fiorcara Sweet Violet had turned out. Two hours later and with the help of sat-nav (or as Keith calls it “sad-nav”) we arrived at our destination to find a beautiful young collie waiting on the front lawn of a picture postcard English cottage. At first Ivy was unsure at the unfamiliar car that had arrived. Kerry was the first to get out of the car, and she was instantly drawn to the waiting Ivy. Uncertainty quickly turned to curiosity as Ivy and Kerry re-aquainted themselves. 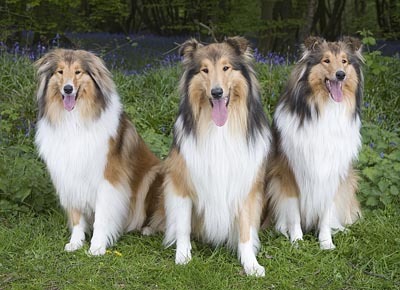 Within seconds the scene became a swirling scene of sable and white as their play-bows and gamboling was accompanied by a collie style yodel of delight as Connor joined in and the three of them circled and bowed and ran with joy! After a delicious barbecue we all went for a walk in the woods where early bluebells were in flower. As afternoon turned into evening, we made our farewells and headed back to Leicestershire with fresh memories of an afternoon with Ivy and two very tired collies in the back of the car! For the second time in 2009 Sandra was on the telephone to a booking agent asking if dogs were allowed. 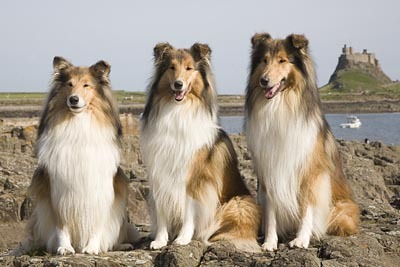 “Four rough collies, they are very well behaved...” she added. So it was that our week in Northumberland began. An address in Chillingham was entered into the now renamed sad-nav, and we were on our way! The cottage that we had rented was very dog friendly and close to the picturesque town of Alnwick, The beach at Bamborough was only 15 mins away by car and the weather forecast for the week was good, so we were set for a lovely holiday! The next few days were a delightful combination of Northumbrian coast and countryside, and we can certainly understand why the area it is considered to be a ‘well kept secret’. The beaches at Bamborough are the best we have ever found on our travels - the sand is hard packed, level and clean and it goes for miles. Alnmouth also is a great destination with another beautiful beach. This also became a favourite as the bay was perfect for a cooling paddle - something that Kerry and Connor became quite fond of doing (usually while Tess looked on with concern - se does not like to get her feet wet and will even go around puddles). One of our day trips was to the Holy island of Lindisfarne. Having checked the tide times for crossing the causeway we were soon there, and parking just outside the village. With all of the traffic kept outside, the whole place was a delight to explore on foot and we soon found a pub that allowed dogs. Next was a short walk to the coastal hills so we could take full advantage of the views across the bay to the monastery. 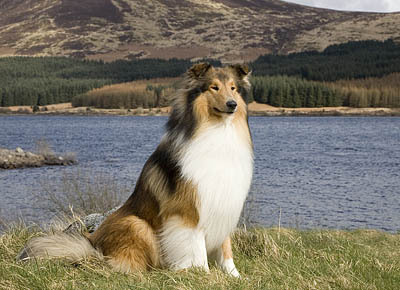 Wherever we went we were stopped by people wanting take photographs of (or in the case of Japanese tourists with) the ‘Lassie dogs’. It seemed that they were quite a sight as they walked along together wondering what all the fuss was about! The only rainy day of the holiday was used on a trip to Edinburgh as we tracked down an elusive bottle of Mortlach single malt. As we drove back to the cottage and the weather turned dry we scoured the coastline looking, but we could find nothing to equal the beaches at Bamborough, so it was to there we returned for an evening run on the beach. With so much discover and being so dog friendly, we’re looking forward to planning a return trip to the well kept secret of Nortumberland again soon! As autumn took hold we set of one windy, rainy day to deepest Shropshire for a fun day of events organized by the Rough and Smooth Collie Training Association. One of the main activities that day was the Canine Good Citizen Tests. Holly and Tess have already passed the Gold award, and Kerry and Connor had passed Bronze. So with our sights set on Silver. The rain did not let up, but the test went ahead and we were pleased that Kerry and Connor performed all the tests well and duly got presented with their Silver award certificates! After the tests Holly took part in some fun agility and got a nice 3rd place rosette. Sandra got out of breath! 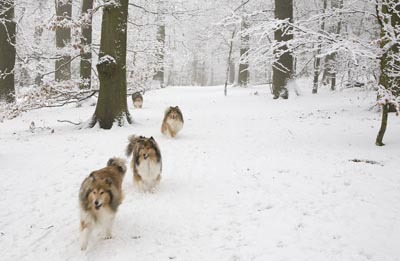 In December 2009, as the Christmas holiday approached, the weather forecasters started to talk about snow, and the probability of a white Christmas became more and more likely. The Christmas presents to all the pups from our last litter were posted and we got ready for a nice two week break from work. The weather turned colder and every morning a hard frost made the fields look white and inviting, but the eagerly awaited snow falls did not put in an appearance. 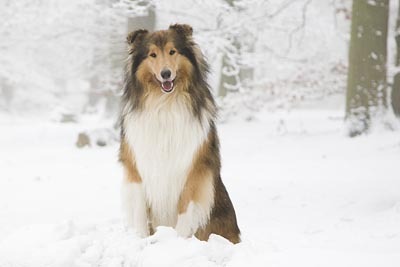 Anyone who knows Collies knows just how much they love the snow, so the waiting continued. Christmas day came and went along with doggie presents, turkey and lazy evenings in front of an open log fire.. The snow put in an appearance - enough to make it a white Christmas but did not stay around too long. Then on the 6th of January 2010 it happened, and it was deep! Holly was probably the first to notice, as she looked out of the window to see everything had disappeared under one of the deepest blankest of the white stuff we have seen in a long time (in twenty years as the television reports later told us). 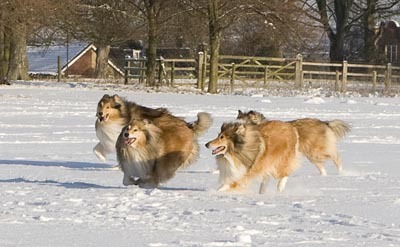 So, off we went to a nearby park to let them all have a good run around in the new and unspoiled snow. They had a great time at Bosworth Park! The snow stayed, the frosts were hard and the whole countryside around Leicestershire and Derbyshire was transformed into a winter wonderland. In search of more photo opportunities, a few days later we headed off to the Outwoods. The scene that we found was absolutely spell-binding. The thick coating of snow made every sound muffled, the frost had made every tree branch an icy-white. The dogs could not wait to run and explore the scene. With hats, gloves and cameras we set off. As usual, Tess led the charge. 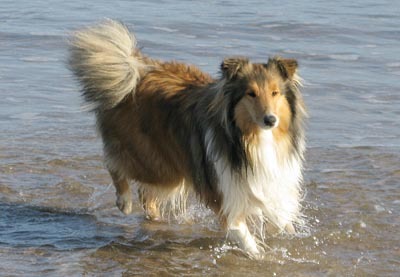 As usual they ran and turned and swirled and barked and yodeled with delight in true collie style. They just love to be out and about in the countryside! If you want to know more, or would simply like to get in contact, we will be delighted to hear from you. Our contact details are here. All four in the April afternoon sun on the hillside above Moneive (left to right Connor, Tess, Holly and Kerry). So you think you can just walk into my garden! 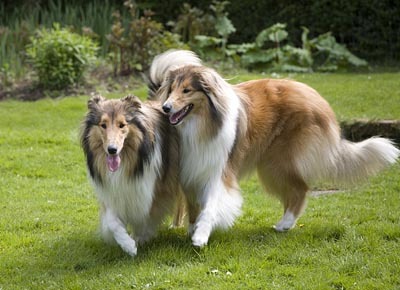 Kerry (left) is escorted by Ivy. Reunited ! Ivy, Connor and Kerry. 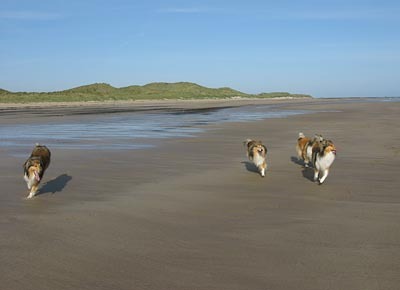 The beach south of Bamborough - ideal for dogs on holiday as Connor, Tess, Holly and Kerry demonstrate! 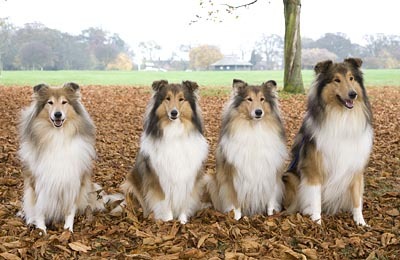 All four: Tess (out of coat), Kerry, Holly and Connor in the autumn leaves at Market Bosworth Park. Above. Connor poses at the Outwoods near Loughborough, which was transformed by the snow into a Christmas card scene (below).